Prior to the dual core frenzy, multiprocessor servers and workstations were referred to by the number of processors that they had. A two-processor workstation would be called a 2-way workstation, and a four-processor server would be called a 4-way server. Both AMD and Intel sell their server/workstation CPUs not only according to performance characteristics (clock speed, cache size, FSB frequency), but also according to the types of systems for which they were designed. For example, the Opteron 252 and Opteron 852 both run at 2.6GHz, but the 252 is for use in up to 2-way configurations, while the 852 is certified for use in 4- and 8-way configurations. The two chips are identical; it's just that one has been run through additional validation and costs a lot more. As you may remember, the first digit in the Opteron's model number denotes the sorts of configurations for which the CPU is validated. So, the 100 series is uniprocessor only, the 200 series works in up to 2-way configurations and the 800 series is certified for 4+ way configurations. AMD's dual core server/workstation CPUs will still carry the Opteron brand, but they will feature higher model numbers; and while single core Opterons increased in model numbers by 2 points for each increase in clock speed, dual core Opterons will increase by 5s. With each "processor" being dual core, AMD will start referring to their Opterons by the number of sockets for which they are designed. For example, the Opteron 100 series will be designed for use in 1-socket systems, the Opteron 200 series will be designed for use in up to 2-socket systems and the Opteron 800 series will be designed for use in 4 or more socket systems. 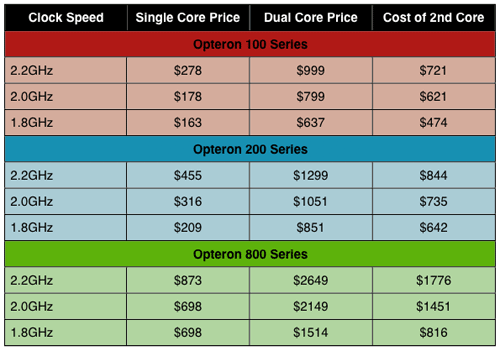 There are three new members of the Opteron family - all dual core CPUs: the Opteron x65, Opteron x70 and Opteron x75. The fastest dual core runs at 2.2GHz, two speed grades lower than the fastest single core CPU - not too shabby at all. The slowest dual core CPU is priced at the same level as the fastest single core CPU; in this case, $637. Unlike Intel, AMD's second core comes at a much higher price. Take a look at the 148 vs. 175. Both run at 2.2GHz, but the dual core chip is over 3.5x the price of the single core CPU. The pricing structure at the 200 and 800 levels doesn't change much either - the stakes are simply higher. AMD's margins on their dual core Opteron parts are huge. On average, the second core costs customers over 3x as much as the first core for any of these CPUs. As you will soon see, the performance benefits are definitely worth it, but know that AMD's pricing is not exactly designed to drive dual core into widespread adoption.